As a physically challenged person and cycling fan, I am writing in support of the Kitsap County Non-motorized Trails Coordinator and our need of one person to coordinate the entire trail system. The present hodge podgy fingers in the same pie method are not working. We need one person to oversee the entire trails plan for our county and no interest other than that. Nothing else makes sense. We need to fully fund the creation of this position and have it directly under the Commission as planned. A planned trail system throughout our county would bring tourists here in droves – more importantly, it would be a massive boost to our own citizens – all of us. 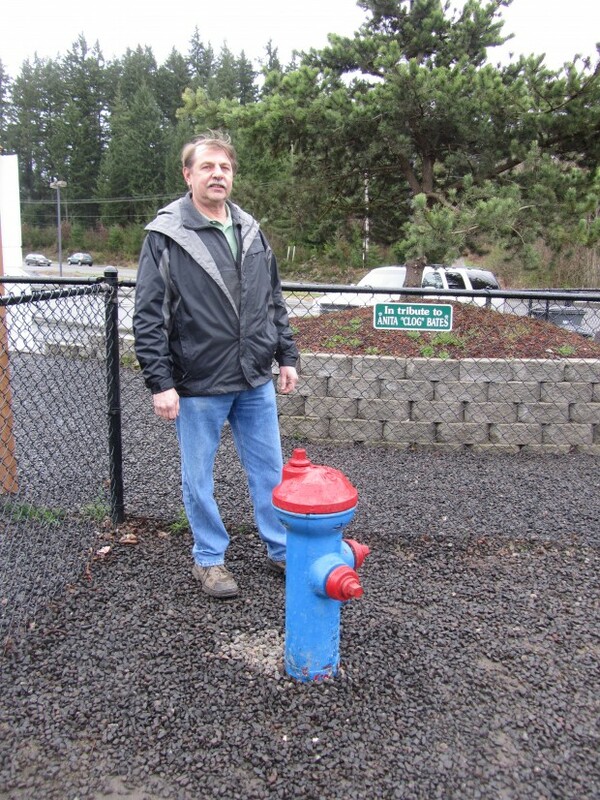 Only a small portion of citizens uses the huge taxpayer outlay of funds you approved for the Howe Farm off Lead Dog Park in South Kitsap yet we all paid. All Kitsap County citizens would benefit from the balanced and planned trail system overseen by a coordinator. I am learning how to get around as a physically challenged person. 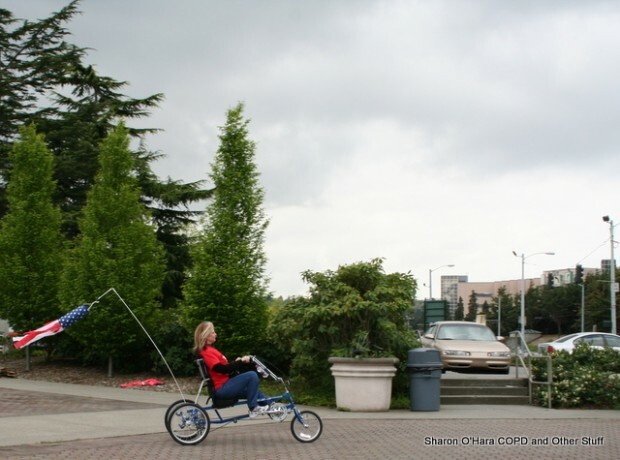 The hand cycle recumbent trike is useful because the bone on bone left hip causes too much pain pedaling a regular recumbent trike. I am not yet able to pedal a regular recumbent trike. The physically challenged in this county NEED the kind of trail system one coordinator would put together as one piece. Our service men and women are coming home, many of them, with physical challenges the trail system would help address. The timing is now for the future of our county in an ever-increasing awareness that physically fit and active people live healthier lives. Let us turn Kitsap County from being an unsafe place to be into a safe place for the NMT fans and the best place to go. One coordinator would have one job and that is the trails – no special interest would cloud the picture. I am guessing the cost to put in that one dog park was far greater than the cost of a trails coordinator benefiting all. Now all I need is find a large flat area to practice and someone to give me a lesson or two and get it road ready with a headlight and stuff. This hand trike turns by leaning the handlebars and post over to whichever direction you want to go..really neat. 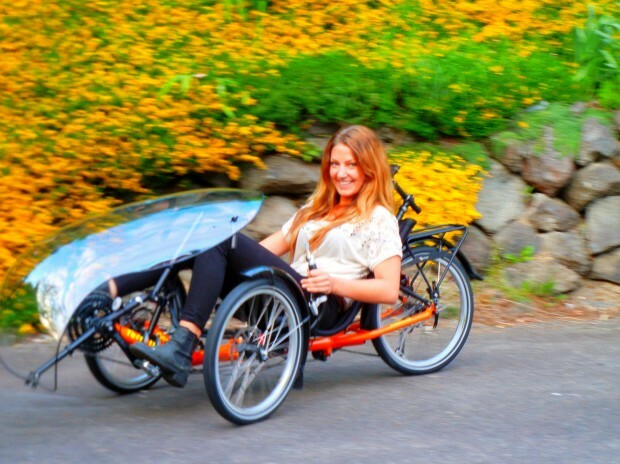 Malin’s first ride on a recumbent trike tadpole… they’re not just for the physically challenged. Please contact our KC County Commissioner’s if you understand the need for one coordinator to oversee the project. Contact them if you don’t understand and thank them for doing a difficult job. We live in a superb county – let’s make it work better. Please. 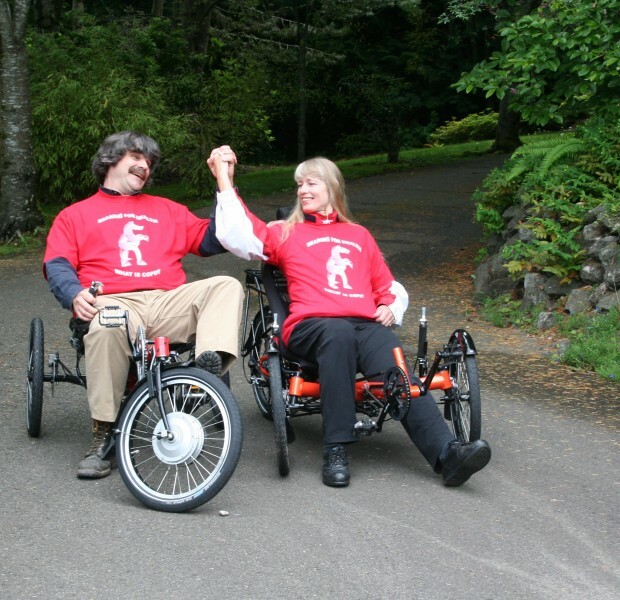 The recumbent trike is God’s gift to the physically challenged. The 3-day Trek Tri Island bike trip with the American Lung Association of Washington a few years ago was the first time I had left the house overnight in 7 years. Not since COPD and then Other Stuff began to hit. Pedaling around the bay from the Port Townsend/Keystone ferry toward Oak Harbor was the first time in 7 years I felt normal again. The recumbent trike set me free. 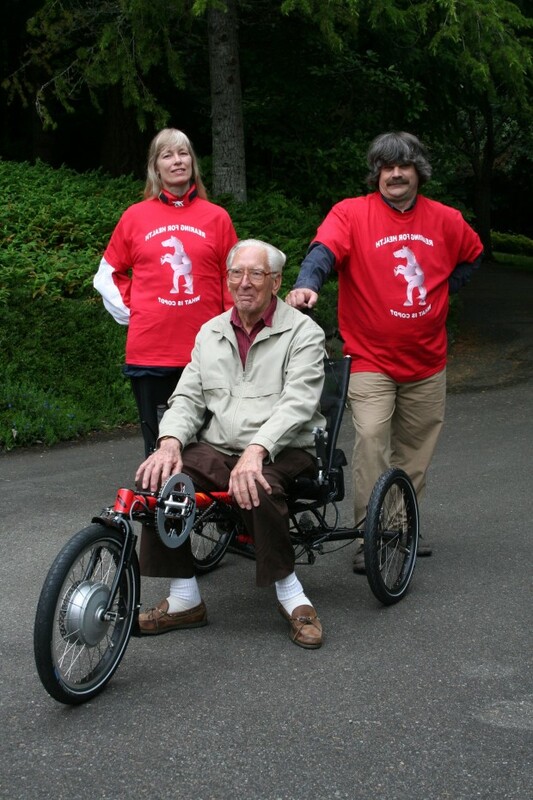 The Mason county couple in the “What is COPD” tee, ride for good health, fun and exercise. He doesn’t let Hip Dysplasia in both hips stop him from moving but at a much slower pace than his wife. His wife is a fast walker challenging herself to move even faster. 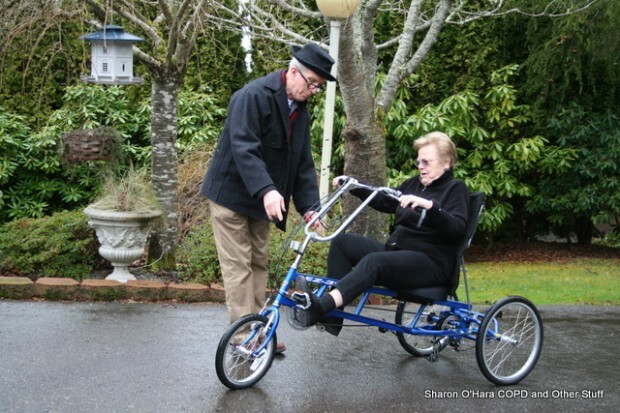 Until he began riding the recumbent trike delta, (two wheels in back), she had to move slowly, at her husband’s pace or he quickly was left behind. I was told the recumbent trike gives him the edges to not only keep up with her; he challenges her to move those hips even faster. 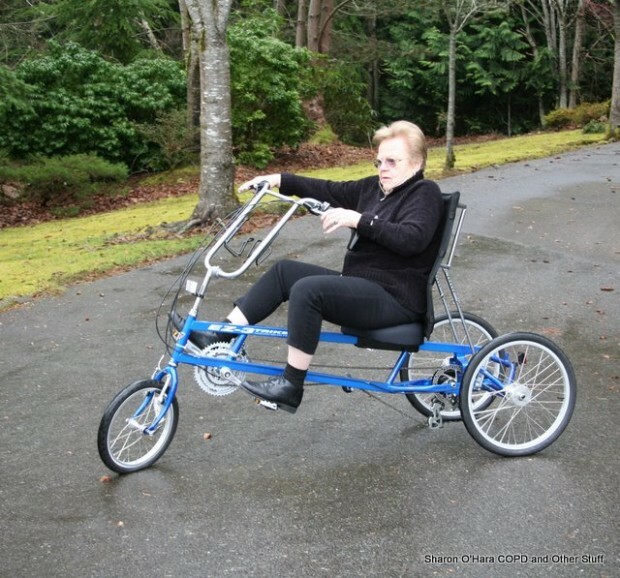 The recumbent trike lets them exercise together for good health in fun and harmony. I took a video of them…unedited…so you can see how they ride. A family affair… the gentleman on the delta is only 92. Following are more photos. My mother’s first time on a bike in about 75 years when she learned to ride the delta at 88 years old. Ask your doctor about riding the recumbent trike for exercise and fun adding to living a quality life and follow her/his recommendations. Check with the local bike shops and bike clubs for further information or ask here on COPD and Other Stuff. For COPDers – muscle utilizes oxygen better than flab and the legs are the largest muscles in the body. The bike is a great form of exercise and the recumbent trike can be a kinder, gentler form of cycling…the comfort mode…or not. 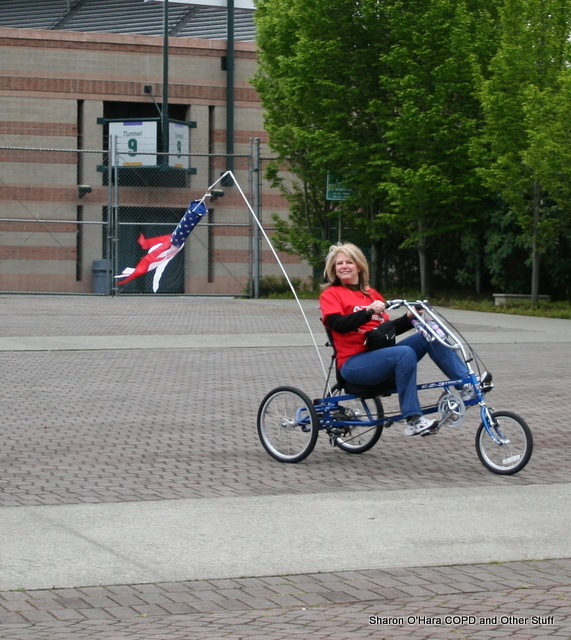 The West Sound Bike Club may have two recumbent trikes to show on the 18th. 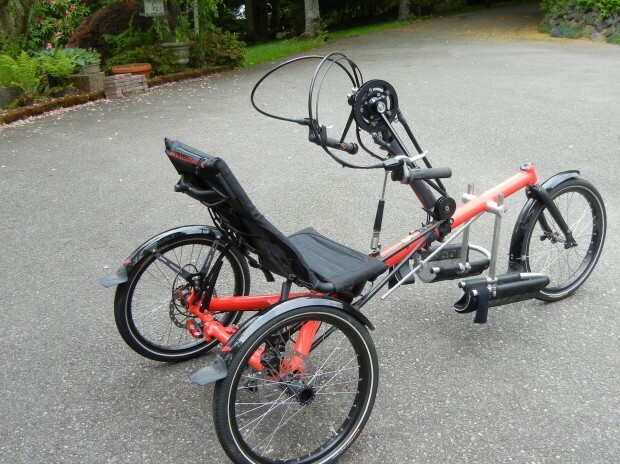 One trike is a delta with an electric assist. The other is a tadpole. Swing by the booth and check them out. West Sound Safety and Health Expo 2010 Free! More than one of the following bike shops may sell and service trikes. The free clinic will start at 6:30pm and go until around 7:30pm. There will be light refreshments provided. The following URL contains the most cycling URL information of any blog I’ve seen. http://www.recumbentblog.com/ Scroll down on the right until you find Dealers.